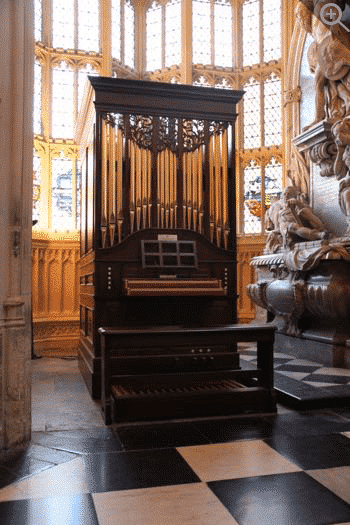 The Queen’s organ was designed to replace the Johann Snetzler organ in the Henry VII Chapel (the Lady Chapel) at Westminster Abbey. The instrument is a gift from the Lord Mayor and the Corporation of London to Her Majesty, Queen Elizabeth II in celebration of her Diamond Jubilee. 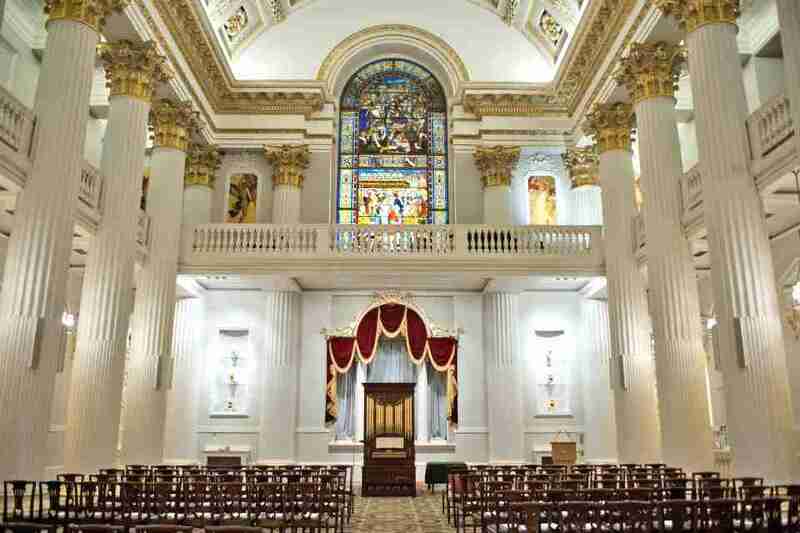 The organ spent much of 2013 at the Mansion House in the City of London before being moved to Westminster Abbey towards the end of the year. Designing this instrument with two venues in mind provided an exceptionally unusual brief. The dimensions of the organ were dictated by the uses to which it was to be put in both venues. 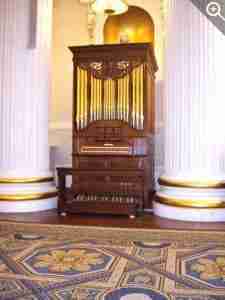 The instrument had to be narrow enough to fit into the limited space of a chantry chapel in Westminster Abbey, but also needed to be moved into different positions in the Mansion House and thus had to pass beneath the chandeliers and between sets of classical pillars in the Salon. All these considerations ultimately dictated the instrument's dimensions. 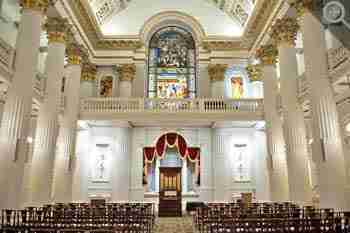 The Mansion House is a timber-framed building and so the weight of the organ had to be calculated to be within acceptable load-bearing limits of the building's structure. From a musical point of view the instrument had to be 'voiced' to be loud enough to accompany a large congregation in the Lady Chapel of the Abbey, as well as needing to have sufficient variety in the choice of organ stops to allow it to be versatile when performing a wide repertoire, both in its short sojourn in the City and thereafter in Westminster Abbey. 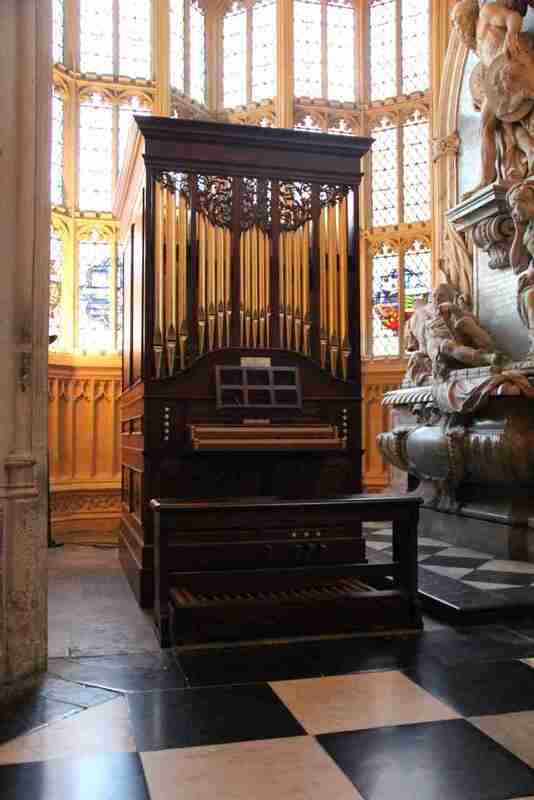 This was a challenging brief for any organ builder and Mander Organs was selected after formal tenders were received. The project consultant was Dr William McVicker. The case design is based loosely on designs of eighteenth century English chamber organs, but that is where any similarity to such instruments ceases. With exception of the blower, keys and small action parts, the organ was constructed entirely in the Mander Organs workshops in Bethnal Green in East London. It is built on a steel chassis (also made in the workshop) which has been fitted with four robust castors; it has been provided with suspension to make the instrument fully moveable. The design and manufacture of the organ took six months and almost 5,000 man-hours to construct. The front pipes are gilded using French Red gold leaf. The organ has two manuals and pedals. Amongst the selection of stops are two surprises: a Pédale de tonnerre (a thunder pedal) and a Rossignol — a nightingale. These so-called 'toy stops' were an important ingredient in European organs during the seventeenth and eighteenth centuries. The thunder (or drum) pedal, when depressed, causes the lowest notes of the organ to sound together, creating a low rumbling — fancifully thought to resemble thunder, a distant storm, or perhaps the sound of a large bass drum. The effect can be used in music to provide a rhythmic drum effect in eighteenth-century trumpet voluntaries, or to punctuate and illustrate the narrative of a dramatic scene in 'programme' music depicting a storm. Several composers (such as Lemmens, Clegg and Sellars) wrote pieces of music which explored this effect. 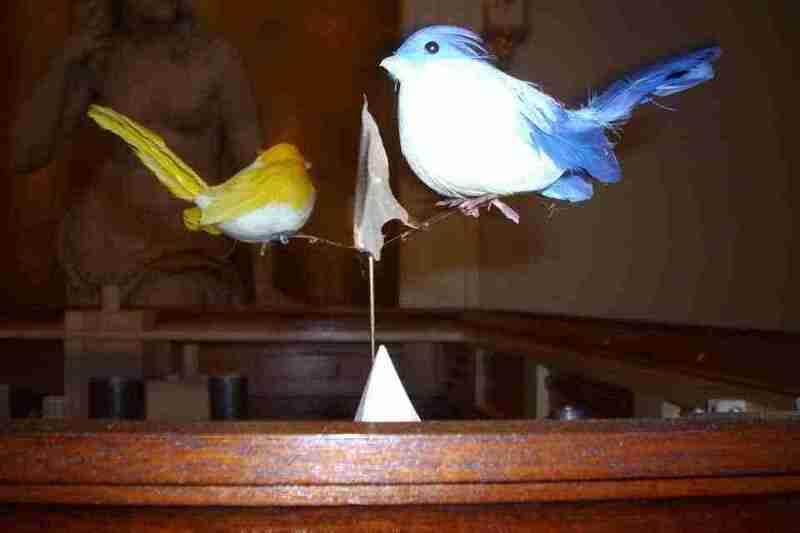 The tweeting sound of the nightingale stop is produced by several high-pitched organ pipes which are turned upside down in a small container of oil or water. The operation of a pedal causes the pipes to sound and to gurgle in the fluid. 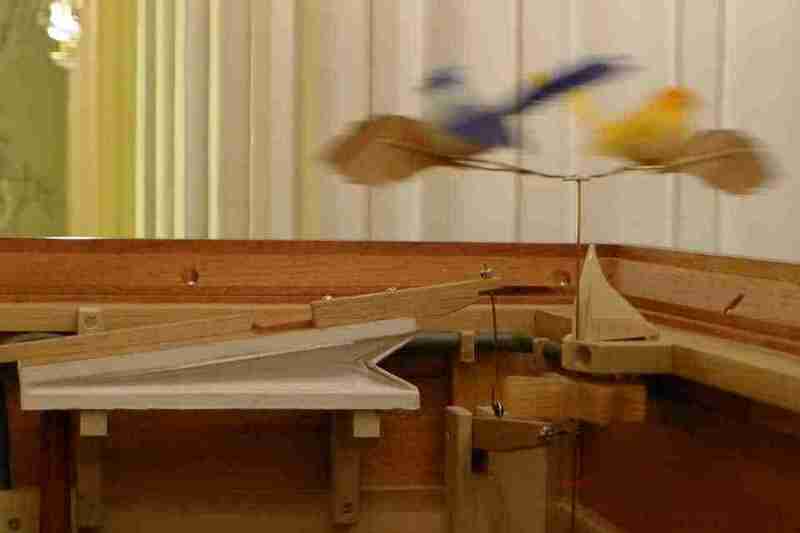 Depressing the pedal engages a mechanism and causes two birds to rise from the top of the instrument's casework, appearing to float as they rotate above the organ. In South Germany it is still possible to find a number of instruments which possess a variety of such 'toy stops'. In Ochsenhausen, for example, when the organist operates a special mechanism a model of an ox emerges from a small pavilion above the central organ case by way of welcome to visitors to the abbey church. Another musical illustration of these effects can be found in the eighteenth-century orchestral repertoire — in Haydn's Toy Symphony for example. Between 1599 and 1600 the organ builder Thomas Dallam went on a sea voyage from London to Constantinople in order to deliver a gift of an organ from Queen Elizabeth I to Sultan Mehmet III. That organ reputedly had both drum and nightingale stops. The current Diamond Jubilee gift from the Lord Mayor and the Corporation of London to Her Majesty, Queen Elizabeth II neatly echos this extraordinary moment in English organ-building history. The Queen's organ is therefore unique amongst contemporary instruments and is almost certainly the only English pipe organ to have been constructed with these mechanisms and effects in at least the last three centuries. 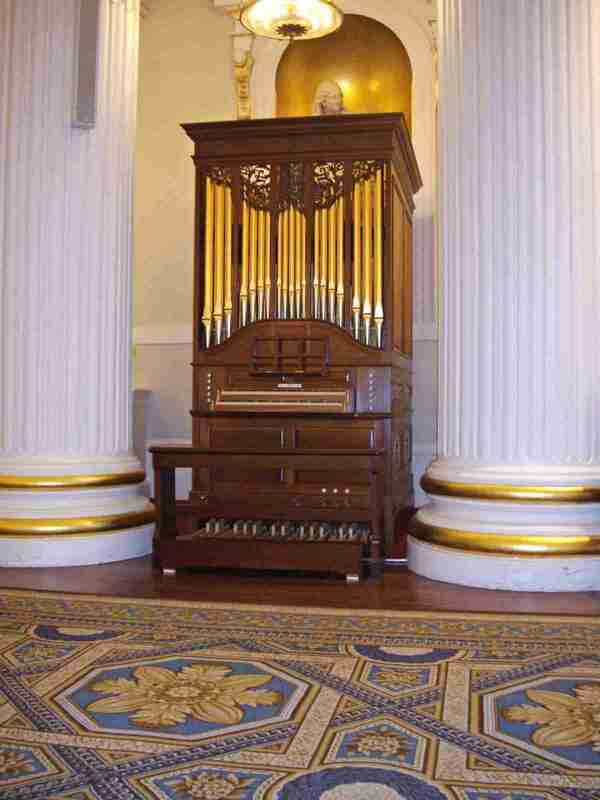 View the Specification of the Queen's Organ (completed 2013) and the pipe scales.